NEVERS, France (BRAIN) — Look Cycle Group has hired industry veteran Mike Gann as vice president of sales and marketing in the United States. Gann brings more than 25 years of experience spanning several facets of the business of cycling. JULIAN, Calif. (BRAIN) — Clear Bicycle Company, the latest endeavor by industry veteran Skip Hess, has hired Steve Boehmke for sales and marketing support. DETROIT (BRAIN) — The Detroit Fitness Foundation has announced that Lexus has paid for naming rights at its indoor multi-sport complex, which includes a 166-meter velodrome. The complex is officially named the Lexus Velodrome and is set to open to the public in January. WEST HILLS, Calif. (BRAIN) — Longtime cycling industry photographer Chris Hatounian was severely injured in a mountain bike accident last month while riding at Mt. Pinos, just north of Los Angeles. SANTA ROSA, Calif. (BRAIN) — World Champion Peter Sagan will participate in a Nov. 28 ride to raise funds for the survivors of the Sonoma County wildfires. 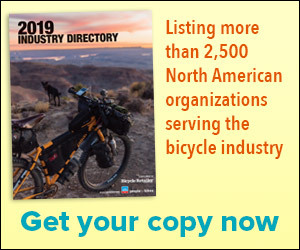 NOVATO, Calif. (BRAIN) — Marin Mountain Bikes Inc. has hired industry veteran Chuck Sikora to represent the brand in Minnesota, Wisconsin, North Dakota, South Dakota and Iowa. LONG BEACH, Calif. (BRAIN) — ACT Lab, an independent third-party accredited laboratory that conducts safety and compliance testing for consumer products, has retained SOAR Communications of Salt Lake City to manage its public relations, media relations, and corporate communications. COLORADO SPRINGS, Colo. (BRAIN) — Borealis Fat Bikes is the latest bike company to appear on a televised entrepreneurs show. Steve Kaczmarek, the brand's owner, appeared on CNBC's "Adventure Capitalists" during a prime-time episode Tuesday. SAN DIEGO, Calif. (BRAIN) — Canyon Bicycles will be the title sponsor of the 2018 Belgian Waffle Ride, the seventh edition of the more-than-140-mile road and off-road event.